There are around twelve species of ‘Barking Deers’ or Muntjacs found across south-east Asia, the Indian subcontinent, southern China and Taiwan. One of the most common and widespread species is the Indian Muntjac (Muntiacus muntjak) which is also known as the Common Muntjac or Red Muntjac. This species is versatile, found in a range of habitats from mangrove forest, grassy lowlands to over 3500m in the oak forests of the Himalayas. Muntjacs are a particularly vocal type of deer, their hoarse barking calls are commonly heard both day and night in forests, woodlands and grasslands wherever they are present. 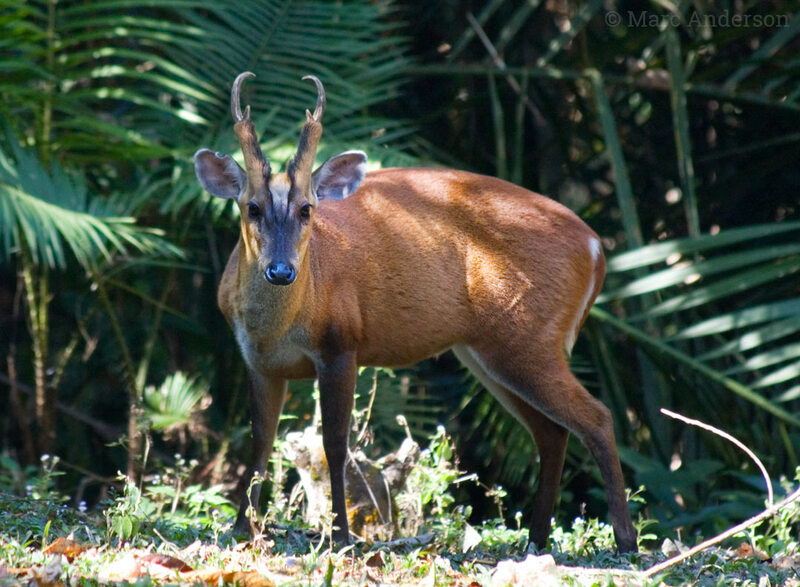 The calls of the Indian Muntjac (Muntiacus muntjak) and Reeve’s Muntjac (Muntiacus reevesi) are well-documented and appear to be indistinguishable from one another. The sounds of other muntjac species are not well-known. Female muntjacs (does) often call to attract males (bucks) when they are in season. They often stand in one place for some time barking repeatedly. Muntjacs also make a similar barking call when they sense danger. SD452a This first sample is an example of the typical loud advertising call of the Common Muntjac or Barking Deer. Recorded in Thungyai Wildlife Sanctuary, Thailand. 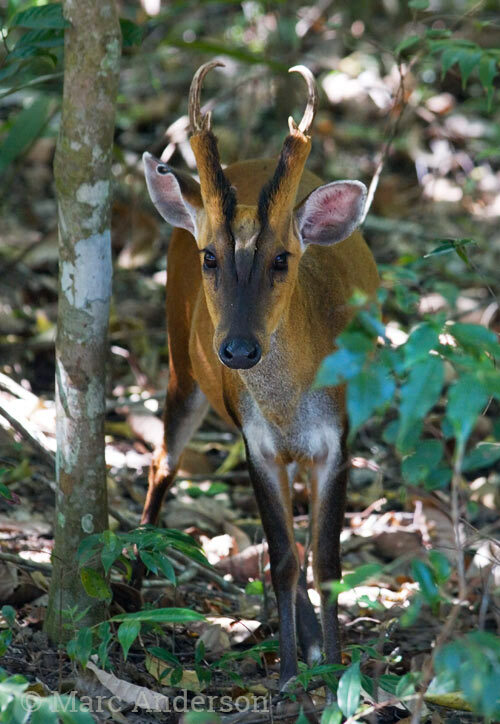 SD454a Another example of typical Barking Deer sounds – this sample was recorded at night in hill rainforest in Kaeng Krachan National Park, Thailand. At this location, both Common Muntjac (Muntiacus muntjak) & Fea’s Muntjac (Muntiacus feae) are present so this could be either of these species. T50a This sample was recorded in the Maliau Basin Conservation Area, Sabah, Borneo, and captures another typical call. Both Common Muntjac ((M. muntjak) & Bornean Yellow Muntjac (M. atherodes) are known from this location so this call could be from either of these species. In the soundscape below, Common Muntjac (Muntiacus muntjak) can be heard calling at night in Doi Inthanon National Park, Thailand. Mountain Scops Owl (Otus spilocephalus) & Collared Scops Owl (Otus lettia) can also be heard along with a variety of insects.